I have donated a significant, framed 16 x 20 inch painting of the Mission San Juan Capistrano to the LPAPA fund-raiser you find below. It is your opportunity to collect a nice piece of historical SoCal and support a great art organization at the same time. 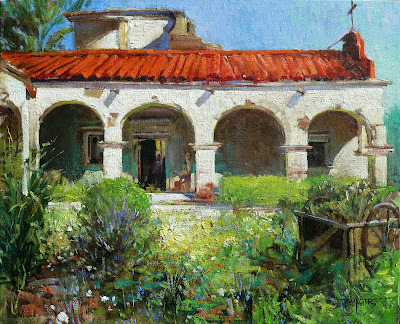 I painted it during the 2011 Laguna Beach Plein Air Invitational and re-worked it significantly in the studio last month. So it is a rare and very developed piece, once carefully constructed to flicker with color when hung under indoor light, I hope you'll come out to the auction to consider it. And of course, if not this painting, then one from the incredible line-up of other artists you find below. Heck, if I didn't already have a conflict I'd bring my own checkbook as the bidding will all start low and you couldn't possibly find work of this caliber anywhere else. I'll be returning to the Laguna Beach Invitation again in October 2013. I hope to see you all again when I do! these remarkable works of art ! by bringing them information and opportunities for advancement. for plein air painting in the contemporary world of art.